Dr. Ramayya Krishnan graduated from IIT-M in 1981 with a B.Tech in Mechanical Engineering. He is currently the Dean of the Heinz College of Information Systems and Public Policy and Professor of Management Science and Information Systems at Carnegie Mellon University. He has been conferred the Distinguished Alumnus Award for the year 2017. His research interests focus on consumer and social behavior in digitally instrumented environments. His work has addressed technical, policy and business problems that arise in these contexts and he has published extensively on these topics. 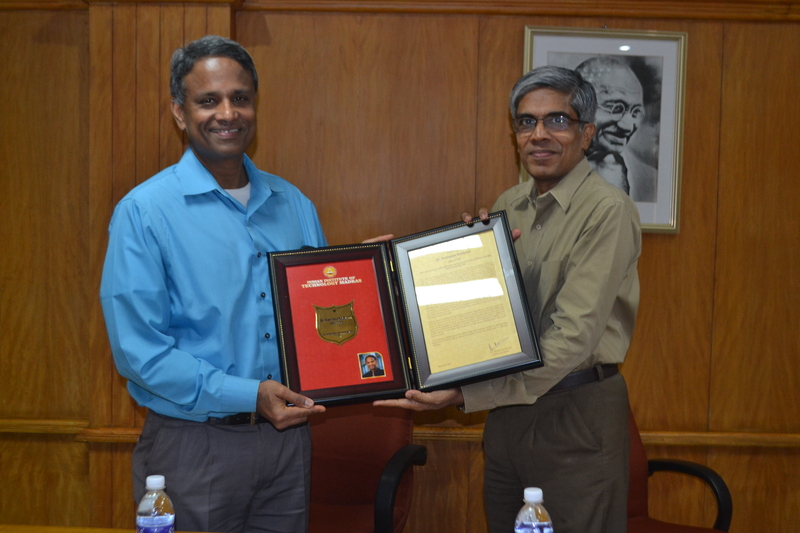 We were fortunate enough to be able to talk to Dr Krishnan when he visited the institute to receive his award. Could you describe your time at IIT Madras? Any fond memories you would like to share? I graduated from IIT-M in 1981 with a B.Tech in mechanical engineering. I have lots of fond memories. I came here when I was relatively young, around fifteen and I kind of grew up here. We had our version of Saarang, called Mardi Gras which was a lot of fun. I used to play hockey which I enjoyed greatly. I was also the General Secretary of my hostel, Godavari, when I was there. I have fond memories of a number of things, from big social events to having a group of classmates, both in Alakananda and then Godavari who were really good friends that I loved to go out with, and over the years, and I’ve kept in touch with them. When you get these bonds and friendship in a young and formative age they stick with you all your life. That’s all on the outside of academics. Academics was initially difficult because I came directly from high school. I was enrolled in the Indian School Certificate or Senior Cambridge, and at that time after eleven years of school you wrote the entrance exam and came here directly. So, going from high school to IIT was a learning curve in terms of getting used to periodicals and the competition. Periodicals were the quiz system IIT-M held in those time but on a regular basis over the course of a term. So just getting used to that is also a fond memory, in the sense that it was one of those difficult things you get used to. All in all, I’ve had really fond memories, and I really feel like I grew up here. Everything I’ve accomplished, I give credit to what happened here. How does it feel to be a Distinguished Alumni Awardee? It’s very humbling. I was told that there are around a hundred and fifty or so distinguished alums, and the number of alums that have graduated from the university is around forty to fifty thousand, a very large number. It’s very humbling to be inducted into a set of people who have had very significant contributions. I’m also very proud that I’m being recognized by my alma mater. Could you share with us your journey after graduating from IIT? I graduated with a degree in Mechanical Engineering. During the course of my time here, one of the things I was excited about was Applied Mathematics which I learnt during my courses in engineering. Graduates of Mechanical Engineering learn a lot of Applied Mathematics and in my case, it was a lot of Optimization and Operations Research that I was excited about. So, after completing my B. Tech here, I went to the University of Texas and enrolled in a program in Industrial Engineering and Operations Research with a minor in Computer Science and Statistics and then went on to a PhD in the same area. The set of people that were in these programs came from across the world, so that was the first sort of confidence boost I got from having gone to IIT, in terms of it having prepared me really well. Then, after completing my graduate studies at Texas, I joined Carnegie Mellon, in the Heinz College of Information Systems and Public Policy. I was excited about applying Operations Research in my training in Computer Science and Statistics, and I was trained in a very interdisciplinary manner at the University of Texas. At Texas, it was a mélange of skills that I learnt and I was really excited about applying that to Information Systems, and I was fortunate in the sense that the Internet and the Web happened at the right time for me. When the browser came out in 1993, that was a huge change and the http protocol had just been defined. You could access all sorts of information by pointing at and clicking on URLs, and the concept of URLs that existed then is something we’re all familiar with now. The idea of distributed information and how one supports decision making in a variety of settings, both societal as well as business settings – was an area ripe with opportunity. I applied my skills to these problems, and I think the two themes were sort of an interdisciplinary approach focused on problem solving, along with a desire to have societal impact. Given the internet and tech boom was after I graduated, I couldn’t have envisioned going into these domains when I was at IIT, but I think many of those foundations were laid here because of Engineering as a discipline, having the opportunity to do the kinds of projects that I did here – when I look back at it, I could say that when I was doing Engineering I was also doing problem solving with the potential to build things that had societal impact. I wouldn’t have articulated it like that at the time, but now I think that was essentially what I was doing. The journey began here, and that is pretty much what I did during the course of my years in academics, and I’ve been at it for a while now, since the late 1980s. In all those years, I’ve kept a foot firmly planted in the university sector but also in the real world. I’ve tried to take these ideas and apply them, be it through the kinds of partnerships with companies, or public sector agencies that I’ve been able to work with and also in terms of the government service roles that I’ve had. I think it’s been a very interesting journey and I owe a great deal to the University which set me on this journey. You were the first Dean of the Heinz College which had its programs setting up when you took over. What were some of the difficulties you faced in the administrative side while also balancing your research activities? The College was an interesting, new academic unit, because it was home to two schools – a new school of Information Systems, which had not here before existed at Carnegie Mellon, and a school of Public Policy Management which was already there. Most of the students in Information Systems came from Computer Science and Engineering, and for Public Policy the students were mostly from a social science background. The faculty again, were from multiple disciplines. I think having a clear and shared vision of what this College was going to accomplish – I’d say that was sort of the number one challenge. Once you have clear objectives, the strategy becomes clear, then the pathway becomes clear, so the question is, what are your objectives? I think, being able to articulate that we were going to be the center of excellence for public policy and technology was a frame for what the College is about. That wasn’t something that I woke up and said one day, “you know, that’s what we’re going to be.” People buying into that shared vision was an important part of the process. The other part was that we were really a place where we understood the societal consequences of technological change, and that of public policy change, so that we could build on this intersection between IT and policy both of which are the two pillars of the School. It took some time for us to articulate that, so I’d say, having clarity on what this place is about was the biggest challenge. Getting students to not feel confined by their disciplines was also an important process. We had an initiative called C-Squared for Connect and Collaborate, which was a strategy designed to meet the objective of getting people to learn from one another, to develop that capacity to work on real-world problems, be it initiatives in healthcare, large-scale consumer behaviour, urban contexts or entertainment. We set up large ecosystems of firms so that faculty and students could have very interesting experiential opportunities in research and education, which also led to interesting professional outcomes for students. Having all of these elements work together and defining that, making it work -that began with having clarity on what the college is going to be for, and what it’s going to be about. All these other pieces just fell into place after we bought into that shared understanding. Could you brief us about your specific research interests? What I’m really excited about todayis large-scale analyses of people and their behaviour in very instrumented kinds of environments. These could be environments with video cameras and audio sensors and there’s data being collected about how we’re interacting with one another, and maybe there’s a mobility tracer of how you got here, to this room, because you’re carrying phones that have GPS sensors on them. These are very detailed traces of behaviour that we have about individuals, and the question is, are there ways of understanding these behaviours that would allow for value to be created for either the individual or for the society, and to do so in ways that would preserve privacy and confidentiality. It’d be very creepy if everything we did was being monitored and followed, be it online or offline. Much of my work has been on what I call “social-cyber-physical systems”- cyber as in online physicals of the real world, and social because people inhabit these systems. It’s both online and offline because of the kinds of things we carry around with us. Having very detailed data about people and their behaviour in these kinds of cyber physical systems, and being able to use models of decision-making and models of behaviour which combine ideas from Operations Research and Economics to solve those problems. This is a very abstract description, a more concrete kind of thing I could talk about would be for instance, you’re at a firm and you have data about people and their detailed email traces, who they meet as well as their performance review data. Using these, you could predict if good performers are likely to leave the firm or in other words, the regrettable departures – people who the firm will feel really bad about losing. We examine their email behaviour, meeting behaviour and performance reviews to see if there are any indicators that would give clues to the firms so that they can intervene and reach a solution. That’s a very concrete example of an organizational kind of problem. Another problem in the urban transportation space that I’m working on is understanding how taxi drivers work towards getting their cabs occupied when they remain unoccupied. We take GPS trace data of the cabs, we collect data on whether or not the cabs are occupied, and the amount of money each driver makes at the end of every day – and it turns out that some drivers make a lot more money than others. Clearly, some drivers are more successful than others. Why? What information signals do they use to better understand where demand is and where supply competition is? Where are they able to go to find customers that another younger, newer, inexperienced driver is unable to? We’ve been working on building models to allow us to understand how experience in taxi drivers help them to gauge demand for their services. The interesting question is whether the firms which own all these taxis should extract the information that is buried in the GPS trace data and make it available to everybody but do so in a way that it just doesn’t redistribute income from the successful drivers to the not-so-successful drivers, but actually increase the size of the economic pie. At the same time the successful drivers should not feel like you’re taking money from them and giving it to somebody who is not as successful but rather, it should be increasing the size of the pie so that both the newer as well as experienced drivers benefit. Are there any issues regarding privacy or say, ethics? The idea of being able to do all of this is in one of two ways –– one is when people ‘opt in’, and this is related to the field of information privacy in terms of what kinds of commitments are you getting from people who choose to opt in about the data that is being collected about them. This is done by sites like Amazon and Flipkart, which show the products and pages that you looked at, making it very clear that a record is being kept. And you’re happy about it because you think that there is some value proposition in it – because the recommendations are actually helping you with reducing your search costs and that’s why you are willing to have every bit of your journey on the Amazon or Flipkart website be tracked. This is the opt-in model. The other model is a technical approach called local differential privacy. This is something which is done in Chrome browsers today. Data about all the sites that you visit are collected by Google but they don’t want to collect it and anonymize it later. What they do is, they collect it in a way where there is noise in the collection itself so that there is no way of recovering whose trace it is. Given that we have these noisy signals, the question is – what is the most we can do with this noisy data to provide decision support to the individual or to the firm? That’s what I do, but there are colleagues of mine at the Heinz College who work on the ethics part which is different. For instance, the screening of resumes when you’re applying for a job is largely an automated classification process. These classification problems are solved by techniques known as classifiers which are working on training data, which is basically data from the past where such classifications took place. But if there are biases in those classifications in the past, the classifier will also be biased. You would think that because an algorithm is doing it, it would be free from bias on account of the person’s gender, last name and so on. But if the algorithmic classifier was trained on past data where such discriminatory behaviour was exhibited, then you’ve essentially created a biased classifier. There’s a lot of work being done today on ethical classifiers, on creating classifiers that are unbiased from training data. This is very interesting branch of research because it’s used in giving loans to people and screening for job interviews, or at least the first round. There are a large number of these gatekeeper roles that are being done by classifiers and it’s important that they be not biased, because then it would just be a continuation of the kind of problems we have today. Nowadays, a lot of people are talking about Big Data and data-dependent decision making. Like you said, it’s being implemented in all these places. What do you feel will be their impact going forward? That’s a big question. It’s already having an impact along the lines of what I just told you. Moreover, I think there’s a lot of opportunity in terms of using data to have evidence-based decision making. That’s what you really want to see happen. Much of the work that I have done, that my colleagues have done, has been oriented in that direction, towards using data to support evidence so that you have policy positions based on it. When you decide to invest in a product or service, you look up reviews for it online, and large numbers of reviews are more trustworthy as they can’t be bought. If most people behave according to data-driven decision making, crowdsourcing is one way in which feedback can be collected. Then there’s obviously an incentive to try to get fake reviews or planted reviews – either about my product or about my competitor’s. It’s another version of the ethical decision-making and data-driven work, so there is that category of activity. So, one category of activity focuses on data for providing evidence-based decision support. Being able to implement that has to take account of all these ethical issues and other factors as well. One has to recognize that if you’re entirely going to rely on data, then its quality, sources reliability and credibility, whether it can be manipulated – all of those are important. This decision making is not limited to business and it can be applied to society and politics, as in the case of the recent US elections which raised questions of why the pundits predicted the wrong outcome. Data-driven decision making is certainly making an impact across the globe. I think we can go farther and look ahead and imagine that these kinds of technologies are going to have an impact beyond decision support to where you might have autonomous decision-making. As in the example of the classifiers, you begin to see greater and greater degrees of intelligence being embedded in for instance, vehicles. When you drive a car, you have blind spot deduction and things that actually prompt you to make your journey safer. In Pittsburgh, where I live, we have underway trials for autonomous cars for taxis. Inevitably, over the next decade, we’re going to see greater degrees of autonomy or using sophisticated data-driven types of approaches in different settings becoming more commonplace. And when you have that, you can begin to ask even bigger societal questions like what happens to jobs which might be displaced due to the growing extent of autonomy. The whole future of work itself becomes a very interesting question. The World Economic Forum has had a discussion on how we are at the threshold of something called the “fourth industrial revolution” and this is the merge of the cyber, the physical and the biological. The pace at which these changes are happening is accelerating. You could say that the first order of changes are the ones that I talked about, and the second-order changes could be even more interesting in terms of having the kind of impact on autonomy and how societies will most likely respond to having those kinds of capabilities in technologies. It really is an exciting time to be young and to be in the kinds of areas that you’re in. How much do you think the institute has changed since you were a student here? I don’t think I’m fully qualified to answer that question, someone who’s been here all these years can answer that question better. My observations are just on the environment, as there are more buildings in the campus, more housing and more trees, especially along Bonn Avenue and Delhi Avenue. There also seems to be greater food choices, which is a good thing. More importantly, the curriculum also seems to have gotten a lot more flexible, and you get a lot more choices in electives and great new alternatives like dual-degree programmes. The research part has also changed. There were the makings of it when I was younger, but it’s become much more active and there are opportunities for the students to extract values from that, and that experience would truly be a differentiating factor. You were the General Secretary of Godavari Hostel and also involved in Mardi Gras, what were those experiences like ? It was a fun experience. I really enjoyed being involved in Mardi Gras. It was a great opportunity to meet students from other parts of the country – you had different colleges from Delhi, Bangalore and Mumbai. In my year, we even had colleges from the Northeast hill regions and that was wonderful. I think the opportunity of being Gen Sec, beyond dealing with the mundane things of food, water and mainly advocating on behalf of your hostel mates to the central administration, as Gen Sec, you used to be a part of the organizing committee of Mardi Gras. Hosting other colleges, dealing with the logistics – that was a lot of fun. At the time, it was also an opportunity for us to have shows and other acts come through, and hang out with people who were our age but with very different backgrounds. Any advice you have for the students? You’re among the best in the country, and I think that being here is a great opportunity. Do the most with it. Figure out what you’re really excited about and go execute whatever it is you are most excited about. This article is part of our Distinguished Alumnus series. For regular updates on our articles follow us on Facebook. To check out more such articles visit www.chennai36.iitm.ac.in.